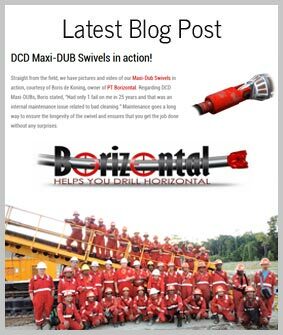 These pullback swivels are designed specifically for horizontal directional drilling applications and after 20 years, they have proven capable of the challenge. 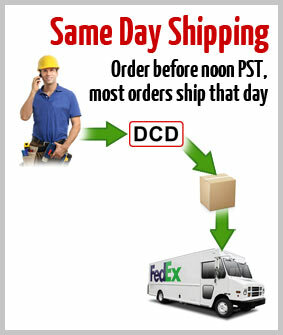 When DCD Design patented the "Harsh Environment Swivel" in 1996, it was ahead of its time. 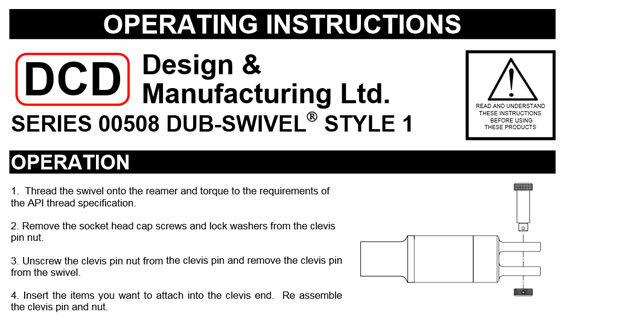 The most important feature of the DUB-Swivel® design was the sealing system: multiple stages that became progressively finer to exclude sand and other coarse particles that can easily destroy a seal. 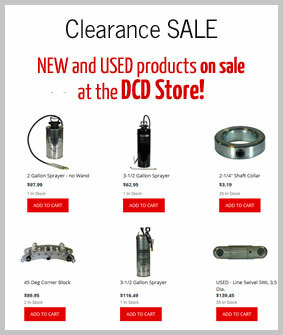 DCD DUB-Swivels® start with a gap seal to keep out larger particles, then a mechanical seal with lapped steel rings rotating against each other. 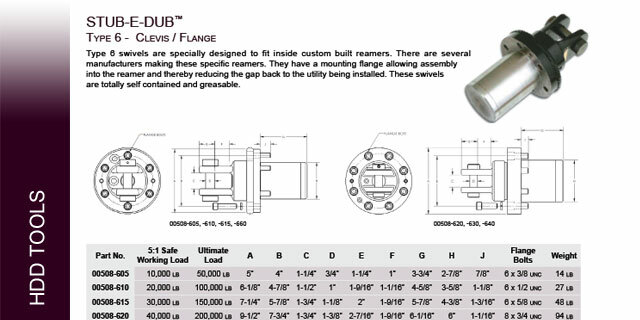 This seal was designed for abrasive environments: military tank drivetrains, bulldozers and cement mixers. 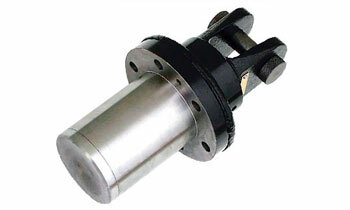 For the final stage of protection, a lip seal is used directly in front of the bearings. 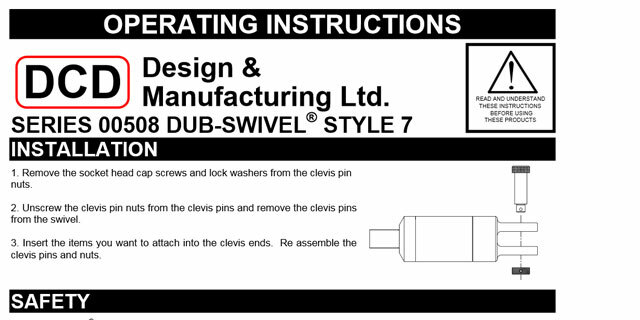 In addition to the sealing system, these swivels offer an easily accessible lubrication system complete with relief valve. A high-quality grease formulation fills the bearing cavity, providing an immersed physical barrier to the rotating bearing elements. Regular maintenance – topping up the grease in small quantities – will ensure a full charge of clean lubricant is always protecting the bearings. 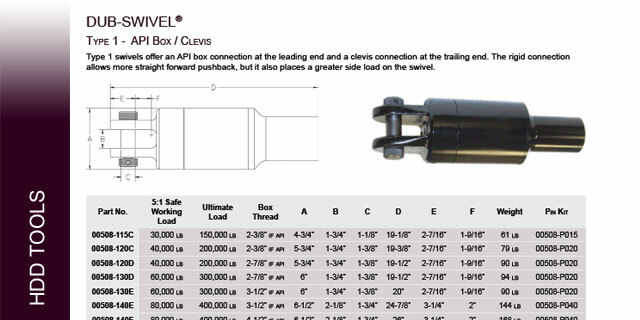 Type 1 swivels offer an API box connection at the leading end and a Clevis connection at the trailing end. The rigid connection allows more straight forward pushback, but it also places a more severe side loading on the swivel. 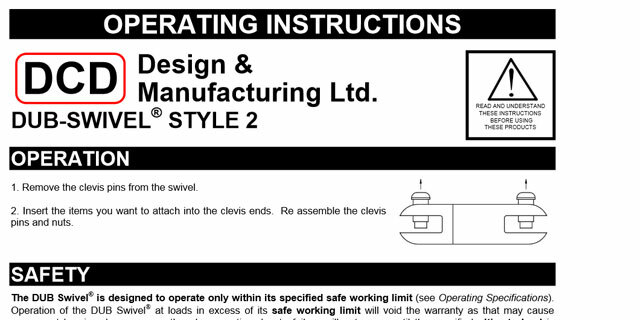 Type 2 swivels offer a Clevis connection at both ends with hardened, lockable Clevis pins. 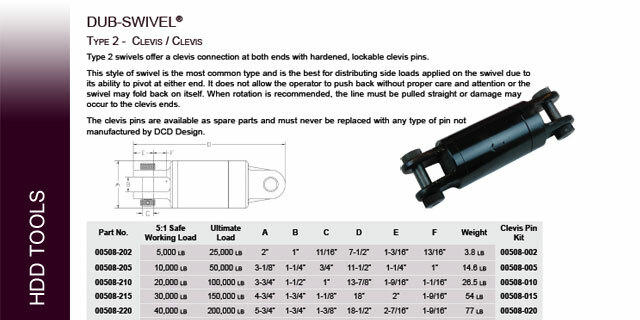 This style of swivel is the most common type and is the best for distributing side loads applied on the swivel due to its ability to pivot at either end. 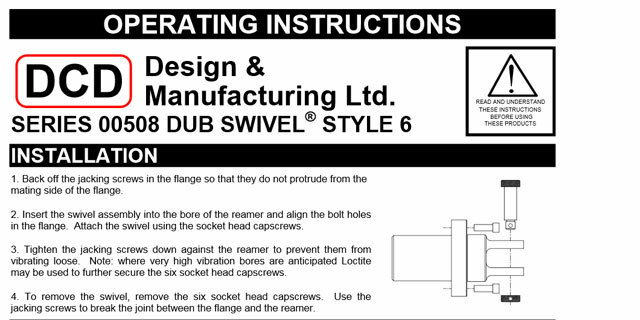 Type 6 swivels ( Stub-e-DUB™) are especially designed to fit inside custom built reamers. 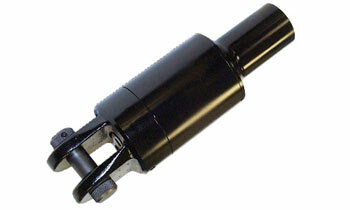 There are several manufacturers making these special reamers. 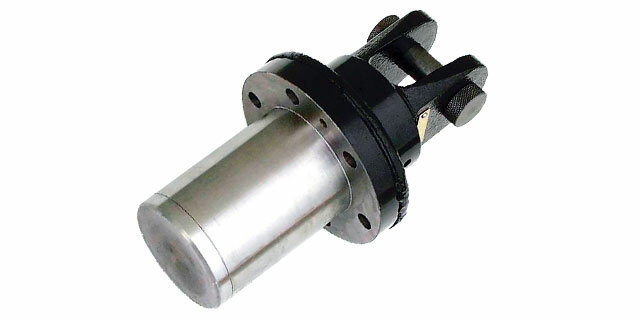 They have a mounting flange allowing assembly into the reamer and thereby reducing the gap back to the utility being installed. 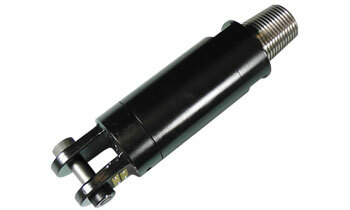 The flange has jacking screws as well as a plugged water port. 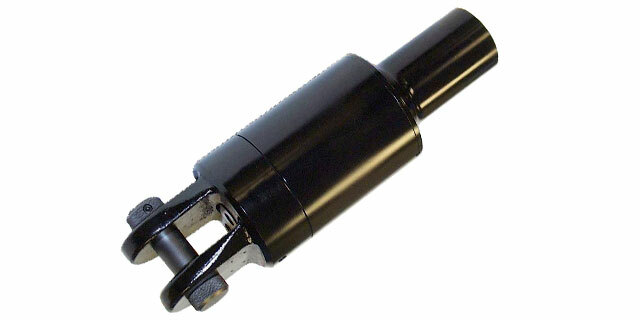 These swivels are totally self contained and greaseable. Type 7 swivels offer a pin connection to the reamer or hole opener ahead of the swivel. 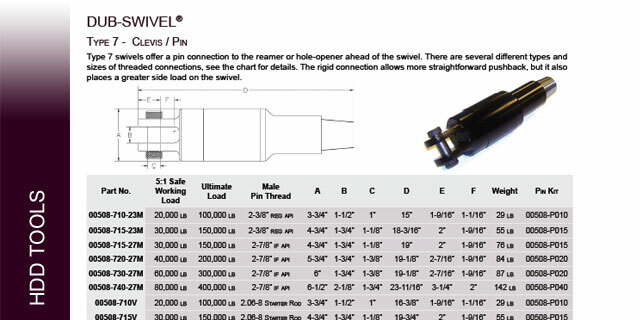 There are several different types and sizes of threaded connections. 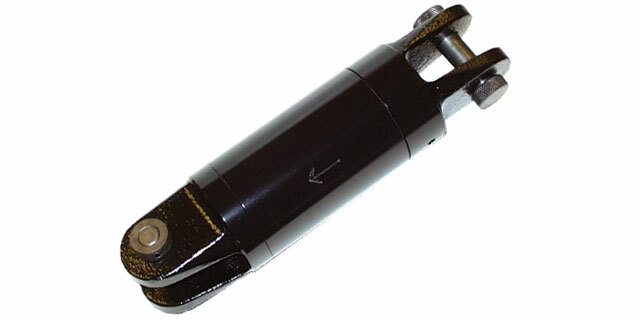 The rigid connection allows more straightforward pushback, but it also places a more severe side loading on the swivel. 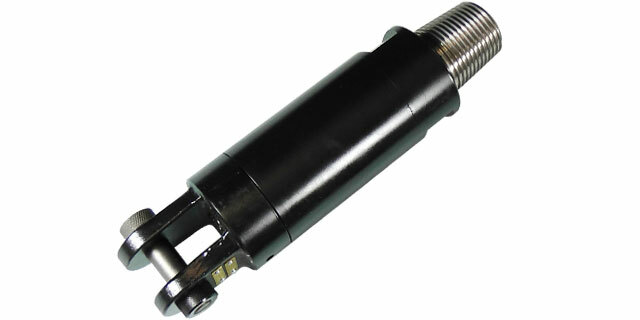 Swivels with either UN or UNEF threads will fit reamers manufactured by Melfred Borzall.